Back in 1985 GM took over Lotus Engineering in Norfolk. The Corvette model range needed a flagship with unbeatable power. Why not get a company renowned for performance engine production to make it? With the very resourceful figure of Tony Rudd the project was set under way using a V8 engine that Lotus had already developed but not placed in any vehicle. The criteria of no modifications to the Corvette chassis coupled with 350 ci, 4.4" bore and other traditional stuff, and the need to produce 400bhp was a tall order. A compromise was made and 375bhp was settled on. Much scratching of heads and the LT5 was spawned, a completely new engine with 16 valve heads. The project started early in 1985, first engine (Phase 1) start-up was on 1st May 1986. This testing showed many problems that were to lay ahead, namely, the single row (simplex) timing chains were not up to the job. The engine design had a tendency to release all its' oil if run over 4000rpm so a redesigned oiling system had to be devised. Enter the Phase Two engine with revised oil systems and eventually twin (duplex) timing chains. By November 1987 a Phase Two engine achieved 200 hours on the test bed with a computerised load and part throttle program. There was now a lot of road testing to be carried out. There have been rumours of ZR1s travelling in convoy at 150mph on the M11 very late at night. Well it's a job and someone has to do it, right?! Now the engine made good progress and external cosmetic changes were made to take into account the need for better air flow. The Phase Three engines were very near to the final article, but much more internal refinement was required. The Phase Four, Five and Six engines all had minor external changes and modifications and the engines which finally made it into the production cars were Phase Seven (in fact the 84 1989 ZR1's produced were production standard). When the ZR1 was announced in 1989 and released to the press, the publicity was sensational, almost every one who drove the car raved about the performance. However for various reasons the car was held at pre-production stage until the 1990 model year. No 1989 models were sold to the public and I am sure some of them will turn up here and there (watch this space). By the time GM sold Lotus to Buggatti in 1994, Lotus had worked on a more powerful 405 bhp version of the engine and these made it into the 93 model year. Sadly the small, for GM, production of the cars came to an end in April 1995, but curiously the last ZR1 engine to be built at the Stillwater, Oklahoma Mercury Marine facility was made on 24th November 1993, all engines built for later years were stored for the relevant model years. There is now a great shortage of LT5 engines and some parts are rarer than the proverbial hen's teeth. However the fact remains that the ZR1 was and still is an amazing vehicle and I still vividly remember my memorable ride in a Lotus development 1989 ZR1 in the hands of their chief test driver around Goodwood circuit when I invited them to our race day back in October 1989. So ended the short but highly successful, albeit expensive LT5 story. 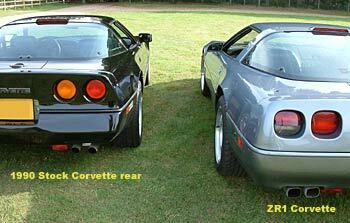 ZR1 Corvettes are still actively competed on the circuits around the USA. We must not forget the 24 hour speed endurance record set by a 'stock' ZR1 which averaged over 175 mph! ZR1 Corvette sold in very small numbers in the later years, perhaps due to the high cost of the ZR1 option (around $30,000 on top of the price of the base Corvette). The legend ceased production in 1995 and these cars are highly sought after now.